As part of its developing “social credit” system, the People’s Republic of China has created software capable of detecting people nearby who are in debt. This system is one of several tactics designed to publicly shame debtors into paying off the money they owe. In addition to having one’s financial struggles on public display, an individual can also be barred from flying or purchasing train tickets due to this low “social credit score.” How do you view this system in terms of China’s politics and treatment of its citizens? Do you think there are any alternatives to encouraging Chinese citizens to pay off their debts in a timely manner? Any club that spends an entire semester bickering, obsessing over minute projects and abandoning mature communication in favor of publicly shaming and defenestrating its leadership could be expected to try operating humbly and productively the following semester. But the Student Union is no club — a point it’s attempting to impress upon the Judiciary, which is poised to decide whether the Senate and Executive Board will be rewarded for last semester’s shenanigans with more funding and no oversight. EDITORIAL: Can this be the last BranVan editorial? Last Thursday, Boston experienced nearly record-breaking freezing temperatures, according to CBS Boston. On such a cold day, the BranVan really had a chance to shine: extra vans could have been chartered to handle the mass of students who did not want to walk outdoors in a 14 degrees Fahrenheit windchill, the reservations system could have been streamlined to enable impromptu rides, and space heaters or designated indoor waiting areas could have been utilized. Unfortunately, in typical BranVan fashion, no emergency plan was put in place and the vans ran as inefficiently as usual. I watch significantly more YouTube videos than I should. In the heaps of media that I consume on a daily basis, very seldom do I pay attention to advertisements. More often than not, I see adverts as an obstacle; if I am not watching the yellow line creep right toward my next video, I watch ads with the reservation of a jaded consumer. It is only when an advertisement oversteps its role as a distant annoyance that I lean in to show even a minor amount of interest. As current United States citizens, we live in Thomas Jefferson’s state of Civic Republicanism. This Jeffersonian idea claims that we have a civic duty to not only our fellow man, but our community. As active citizens, we have an obligation to participate in civic affairs. Besides voting, we are expected to march, organize sit-ins and employ other methods of protest to ensure our voices are heard. Through this sacrifice of time and other responsibilities, we become the catalysts for the changes we seek. Last Thanksgiving, I got up at four o’clock in the morning to go to Logan International Airport in Boston. When I left, it was freezing cold; my flight was briefly delayed on account of the snow. As I watched it fall through the terminal window, I remember thinking how happy I would be to be back in California, where my hometown’s last snowfall was in the 1960s. In response to an open letter addressed to President Ron Liebowitz concerning how Brandeis accommodates its students with disabilities, the University held a public forum with the intent of acknowledging, learning from and finding solutions to many of the struggles and inconveniences these community members face. Tuesday’s forum began with Provost Lisa Lynch and Senior Vice President Stewart Uretsky addressing an audience seated at round tables whereupon smaller and more intimate discussions were held. This board commends the University for its willingness to respond to widespread criticism of the quality of life for students with disabilities. However, while planned with good intentions, this meeting did little to directly address many of the concerns of students with disabilities, which extend far beyond wheelchair access to certain buildings and will likely do little in the long term to address the well-being of students with disabilities. This past weekend, the nominees for the 2019 Academy awards were revealed. Traditionally, nominations and awards for coveted titles such as “Best Picture” and “Best Actor” have been given to more drama-oriented, realistic and predominantly white-casted films. This awards season, however, sees action blockbusters such as Black Panther — which is set in the fictional country of the popular Marvel superhero with a predominantly Black cast — and fan-favorite remake A Star is Born — a more musically oriented film with pop singer Lady Gaga in a lead role — with best picture nominations, two films that might have garnered little recognition in previous years. To many film critics, these nominations are seen as a step in the right direction for the Academy, which usually recognizes year-end drama releases instead. What are your thoughts on the state of the Academy, and how do you view these nominations in the context of previous awards shows? Brandeis University’s closure of the Schuster Institute for Investigative Journalism leaves a blind spot in the school’s commitment to social justice. For the past 14 years, the Institute has given students and professional researchers alike a structured avenue to practice what Brandeis preaches in terms of social change — allowing them to learn directly from professional researchers how to use their knowledge and skill sets for the good of others. According to its mission statement, Brandeis “affirms the importance of a broad and critical education in enriching the lives of students and preparing them for full participation in a changing society, capable of promoting their own welfare, yet remaining deeply concerned about the welfare of others.” The Schuster Institute, and specifically the Justice Brandeis Law Project, embodied this philosophy better perhaps than any other university. 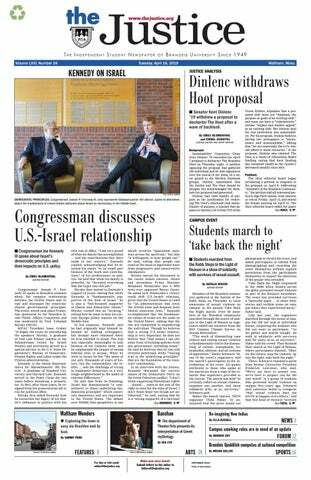 In their absence, Brandeis must create new opportunities for students to apply the rule of law to real-world cases. Trade and the economy were two of the major cornerstones of Donald Trump’s presidential campaign. In an appeal to voters of the rust belt states, many of which also happen to be swing states, Trump asserted that he would fix the “disastrous” trade deals imposed by the previous administration in a bid to bring back manufacturing jobs that were outsourced overseas. The main way Trump plans to fix these trade deals is through tariffs. A tariff is a tax on an imported good, and a 15-percent tariff, for example, would indicate that for every dollar of that good a company buys, the company would have to pay the United States government 15 cents. The effect of this tariff is a higher price for the good for both consumers and producers alike, as producers inexorably due to an increase in manufacturing costs. After less than two years into his first term in office, one of the products that Trump has implemented tariffs on is steel. This has produced a wide range of reactions from across the political spectrum. Unsurprisingly, Trump has doubled down and defended his policies even as some of his top economic advisors, such as former National Security Advisor Gary Cohn, have resigned in opposition. In reaction to these new tariffs, there have been those who argue that Trump’s policies hurt the economy more than they help it, but there have been others who have supported them, most notably the domestic manufacturers of these items. A survey of leading economists from the Initiative of Global Markets indicated that although the tariffs would benefit some companies, the net economic losses as a result would outweigh the net economic gains. The organizations who would benefit from these tariffs are the domestic producers of these products, while the companies that would be undermined are those that utilize these raw materials for their manufacturing plants that in turn would be hurt by the rising costs. After 14 years of cutting-edge journalism, the Schuster Institute for Investigative Journalism closed last month, according to a Dec. 20 email from University Provost Lisa M. Lynch. Lynch explained that the funds necessary to support the Institute were “not forthcoming.” She expressed hope, however, that the University could “integrate… practical experience with journalism in our academic programs.” This board understands the financial reasons for closing the Institute, but calls on the University to revitalize its Journalism program, create new opportunities for undergraduate field experience and develop a curriculum relevant to the digital age. The current government shutdown is the longest in United States history. Pay is being withheld from 800,000 federal workers, many of whom live paycheck-to-paycheck. Of these workers, 420,000 are still required to show up to work, according to CBS. The FDA has stopped inspections of certain food groups, over 40,000 immigration court hearings have been cancelled and Native American tribes that rely on federal funding are struggling to provide healthcare, road maintenance, law enforcement and other basic amenities, per the New York Times. The shutdown has also resulted a hefty economic cost. Standard & Poor’s Global Ratings estimate that if the shutdown lasts one more week, it will cost the economy $5.7 billion. Following the resignation of former United States Attorney General Jeff Sessions, President Trump has nominated William Barr, former Attorney General of the United States during the Bush administration. Barr has a long history of service in the federal government and leans towards the right of the political spectrum, with conservative views on immigration, abortion and the separation of church and state. Should he be confirmed by the Senate, how do you think Barr’s policy positions and political history within the United States will impact the current state of affairs in Washington? When you were younger, did you ever do something you were not supposed to and avoid punishment by blaming another? Whether it be a sibling or pet, someone always has to take the blame. Without assigning blame, how can there be justice? This notion of the wrongly accused goes far beyond blaming your sister for breaking the dishwasher or your dog for eating your homework; many individuals have been wrongly imprisoned for another’s crime for generations. Some spend decades behind bars for crimes they did not commit. These individuals are wrongly imprisoned on behalf of a false accusation. Then, to add insult to injury, the little justice they received from being released is negligible at best because states are not mandated to compensate these people, and many tend to be uneducated and unemployed. Unfortunately, these forgotten members of our society are set up to fail. As this is clearly unacceptable, states should be mandated to pay an annual minimum of $50,000 to each individual once they have been exonerated.